So my boyfriend Matt and I have been doing long distance since June. It's out first time being apart outside of school breaks and I knew it wasn't going to be easy. We had out Labor Day Weekend on the calendar, but when it hit mid-July I knew I had to see him before then. I chose the weekend of the 8th to visit him at his work training in Raleigh. It was my birthday weekend. What better gift than to see your best friend on your birthday? 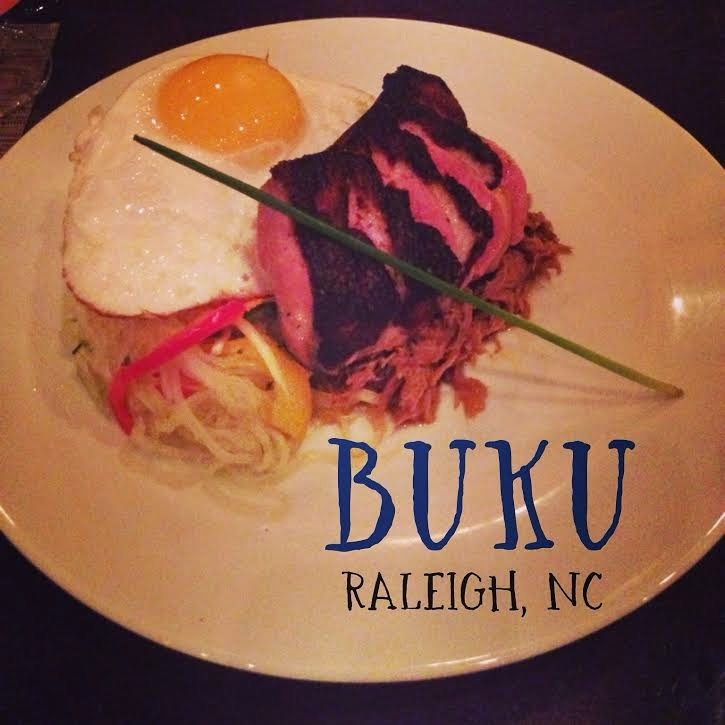 For my birthday dinner, Matt took me to a restaurant called Buku downtown Raleigh that boasted of small plates of global street food. Matt and I haven't met a cuisine we didn't like (and regularly share Indian and Thai takeout) so we figured this could be a great place. Small plates, lots of flavors. We started out by asking the waitress what her favorite dishes are on the menu. She pointed out some smaller plates and a few of the larger plates and so we decided to get 3 small plates and one large. 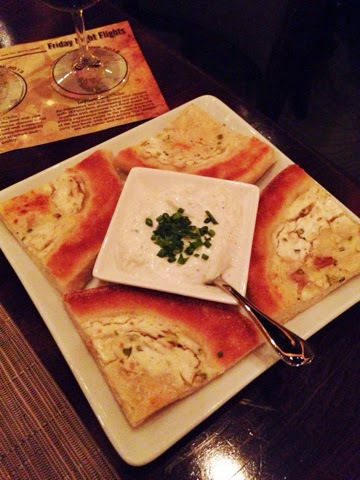 One of our small plates we got was the "Naan." This is in quotations because it wasn't like the normal Naan you get at an Indian restaurant. It was a pretty simple flatbread with a yogurt sauce and spices but it wasn't like the chewy, bubbly tandoori-cooked flat bread that I'm used to. To be fair, the waitress did warn us that every dish had a "Buku spin" on it. 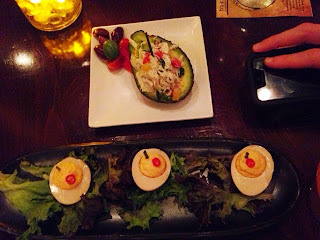 Our other two small plates was the Burmese deviled eggs and the crab-stuffed avocado. I'm not a huge deviled eggs person, but holy cow I would eat deviled eggs everyday if they tasted like this. They had Thai chili in it so it gave a great smoky/spicy flavor. Way better than the mayo flavor I'm used to. I was really excited about the crab-stuffed avocado, but it wasn't as flavor able as I was expecting. On the menu it said that it had a citrus vinaigrette on it, but I didn't get any of that flavor at all. Maybe they forgot to add it to ours? The avocado was also cold like it had been in the refrigerator all day and was overall hard to get into with my fork. It was a "meh". Next time I would go with all the waitresses recommendations on the small plates. 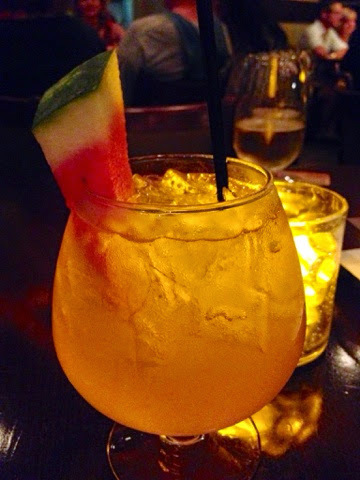 I wasn't too bothered by the disappointing crab stuffed avocado when I go this bubbly watermelon sangria. Delish. And now for the holy grail of our meal: Filipino Adobe Duck, 3 ways! Yes I said 3. Can you spot them? 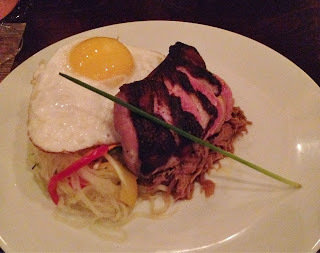 There's a seared duck breast, pulled duck confit underneath, and the 3rd is the egg! I can now say that I've had duck egg. Matt was very skeptical of the fried egg, but I ate a bunch of it with the coconut rice it sat on top of. It honestly tasted just like a regular egg, it was just much larger. The duck breast and duck confit were phenomenal too. Very tender and had a great adobe flavor. 3 small plates and the one large plate was the perfect amount of food. Until they delivered a mini chocolate cake for my birthday. It honestly tasted like a Hoho. 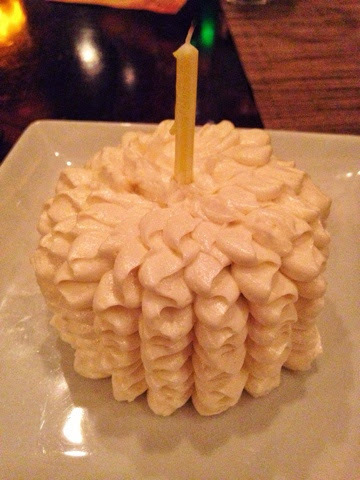 I kind of wished I could have chosen a dessert because they she some exotic looking options, but girlfriends not gonna complain about a free cake on her birthday. If you find yourself in Raleigh stop into Buku!